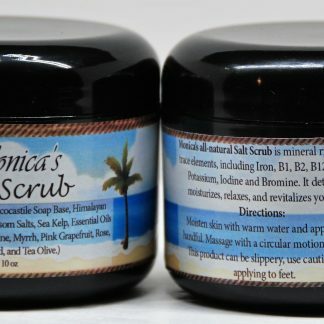 Monica’s salt scrub, smells and feels amazing as you enjoy the different textures of salt, you melt away the stress and enjoy the fresh clean feeling from deep cleaning, moisturizes, relaxes detoxifies and revitalizes your skin. What’s in our base: An in shop mineral rich, spa creation! Essential Oils: To create the relaxing mood, to forget about the world as you enjoy your soft skin and amazing scent. Unlike anything you’ve ever tried, this scrub is the Ultimate experience! A Monica’s Must Have!